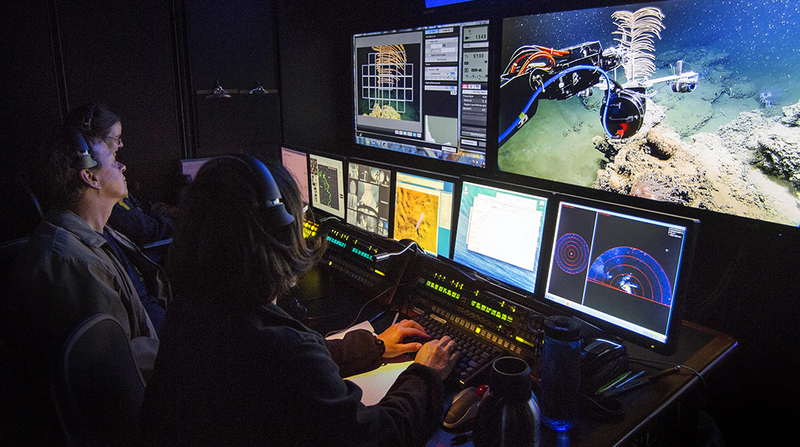 ECOGIG researchers looking at deep sea corals in a ROV control room. Photo courtesy of Ocean Exploration Trust/ECOGIG. The vision of the International Wildlife Film Festival (IWFF) is an engaged community that finds itself through cinema and helps the planet to heal. The IWFF values respect, diversity, collaboration, and stewardship - it is an international event, founded in 1977 at the University of Montana, with special guests, world premieres and one of the largest and most diverse audiences in the region, having 6,000 attendees and 2,000 students. ECOGIG's short documentary film "Jewels of the Gulf," about deep sea corals in the Gulf of Mexico (produced by the ECOGIG outreach office and directed by Allison Albritton (Ocean Allison)), was selected to be shown at the 41st annual International Wildlife Film Festival in their "Deep Dive" short film block. Attendees will get to travel under the water's surface to witness the extraordinary species that make the ocean their home. We are honored to have our film shown alongside some fantastic ocean themed films!